Home News Politics WHY EXPOSE DE LIMA'S RELATIONSHIP WITH HER DRIVER? WHY EXPOSE DE LIMA'S RELATIONSHIP WITH HER DRIVER? President Rodrigo Duterte on Sunday justified why he exposed the alleged affair of Sen. Leila De Lima with her former driver, Ronnie Dayan. It was to show how corruption managed to go “unhampered” inside the New Bilibid Prisons (NBP) during De Lima’s term as secretary of justice, Duterte said. 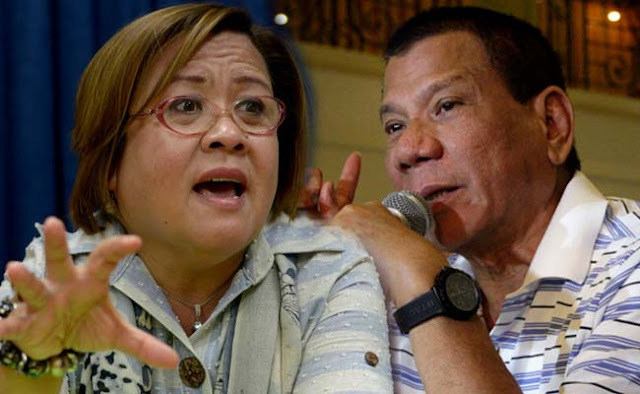 “What is really very crucial there is the fact that the relationship [that De Lima had] with her driver … gave rise to the corruption that was happening inside the national penitentiary,” Duterte told an early morning press conference at the Presidential Guesthouse in Davao City. “You know, some of my relatives, the women, were asking me: why did you have to include the relationship between De Lima and her driver? The crux of the matter is if I do not talk about that relationship with De Lima to her driver then there is no topic to talk about,” said the President. The President claimed that during De Lima’s stint as justice secretary, special privileges were extended to “almost all” inmates. “Are you not surprised that during her term and for a longer period … there were special privileges granted to almost all inmates? There were guns. There were parties held almost every night. There was a combo, a musical group, liquor and alcoholic drinks flowed freely and women went inside and out the prison,” he said. The tough-talking Chief Executive accused De Lima of authorizing Dayan to let illegal activities happen inside the NBP. “If I do not mention the connect[ion] between the senator … and her driver, how would I explain to the public the state that these things that happened: the partying, drugs, and even cooking shabu, that went unbridled, unhampered?” he said. He added, “Would you think that a driver of a department of justice employee could have allowed these things all by himself? All of these could have only happened if there was a go signal from the head of the department” who was De Lima, Duterte said. The President earlier tagged Dayan as De Lima’s lover, describing their alleged relationship as “immoral.” He also claimed that Dayan served as her bagman who received payoffs from NBP drug lords. De Lima has denied the President’s allegations, warning him that he might lose face if he continued to accuse her of being involved in illegal activities. The senator said that she was willing to be shot if the President could produce real evidence to substantiate his allegations. “I’m willing to resign, I’m willing to be shot in front of the President if there is real evidence—not coerced, not manufactured, not fabricated, not invented,” De Lima told a press conference in Quezon City on Saturday. The senator said Dayan was reportedly in hiding for fear of his safety.